Firehouse is your music store alternative in the Atlanta area. We are a local, family-owned business and offer a wide selection of new and used music gear, lessons, repairs, and rentals. Our staff are trained musicians and eager to help with anything you need. In addition to individual lessons, we offer two educational programs – the all-ages Academy of Music Performance (AMP) that gives students a chance to play in a band and WeeJam, a musical foundation program for children ages 0-6. To learn more about AMP or WeeJam see our music lessons page. We carry a range of top brands for the beginner to the serious musician. Guitar brands include Fender, Takamine, Michael Kelly, T.C. Electronics and Visual Sound. Drummers will find Pearl, Zildjian and more. Keyboard, mic and PA brands include Peavey, Yamaha and Mackie. Not sure what’s for you? Stop in and we can help you make the right selection. In addition to musical instruments and lessons Firehouse offers music rentals and repairs. In Atlanta for a short period of time? Stop into Firehouse and we will rent you the gear you need. Need something fixed? 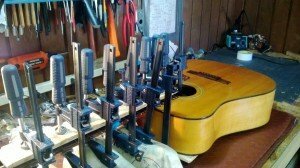 Our repair techs will get your instrument working again.